Landscaping steep slopes can be a challenge. Your house may be at a higher elevation with your land sloping down and away from it. Your land might also slope towards your house, your house being at a low point. When landscaping steep slopes in this situation, proper drainage is particularly important. Regardless, hillside landscaping takes some creativity and knowledge to design for both nice aesthetics and function. The extent of the challenge depends on actually how steep of a slope we are talking about. Sometimes a planting design alone will work, while in other situations terracing would be best. The steepest slope that you can mow comfortably is 3:1 or thirty three percent. Imagine being able to mow on a hill that is the steepest you can go. That's a 3:1 slope. Technically, this means that there would be a one foot rise in elevation for every three feet of distance. In other words, if you had a slope that was nine feet long, the top of the hill would be three feet higher than the bottom. Most of you have seen handicap ramps. A handicap ramp slopes at a maximum of eight percent. This is a front slope on my own property. 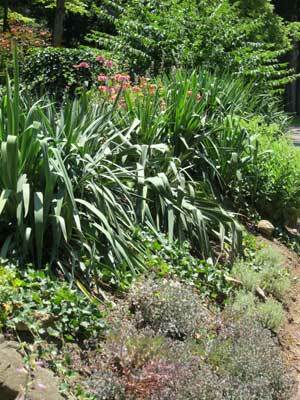 Drought tolerant plants were planted on this slope to reduce watering needs. The planting was young here. Here it is after some time has gone by. Catmint 'Walker's Low' is in the forefront. Notice how this plant is repeated in the design. This is another area with Geranium 'Johnson's Blue' in the front. This perennial blooms almost all summer long. Another nice one to use is Geranium 'Rozanne'. This is the same slope in the fall at a later time. Visit my page on xeriscape plants to see what I did! The maximum slope for hillside landscaping should be 3:1. These types of areas can be dry due to water traveling downwards and not seeping into the ground. Therefore, use plants that are somewhat drought tolerant. Watering can be a problem with steep slope gardening. A sprinkler system helps tremendously, particularly if it is a large sloped area.Drip irrigation is good option. However, plant it right and you won't need a watering system! In addition, if it is a large area there is also the problem of access for weeding. Adding a thick layer of mulch, three inches deep, will help. There are also chemicals available to deter weed growth. However, there are more environmentally friendly solutions. Having the complete area covered by plant material will keep most weeds from emerging. Using masses of groundcover, especially the faster growing or aggressive ones, is an excellent option. Do NOT use Crown Vetch or you will have a nightmare on your hands! 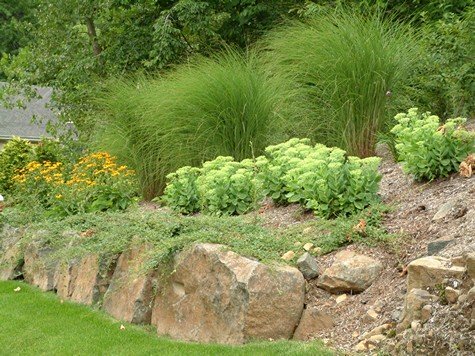 Planting groundcover when landscaping steep slopes should be a large part of your landscape design, which can include shrubs, perennials, and even some landscape trees to create shade. 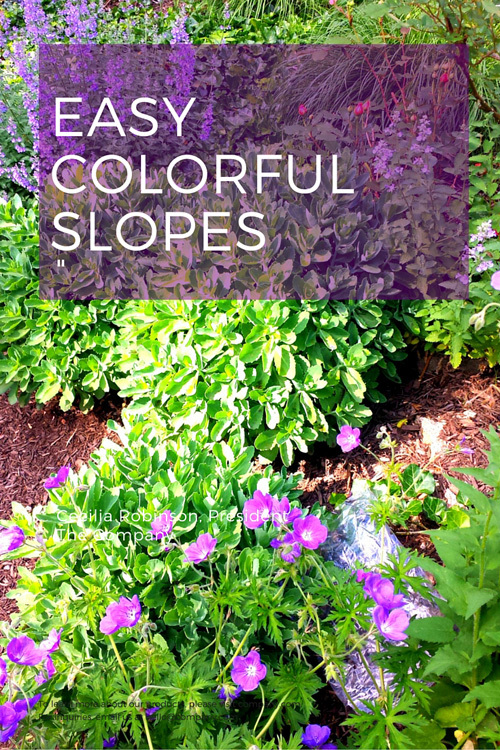 Use masses of plant types when landscaping steep slopes (and in all landscape design). Keep the taller ones at the top with the lower plants towards the bottom. Many colorful perennials with lots of different textures. Add a boulder wall to reduce the slope. However, do break this "rule" to avoid monotony. 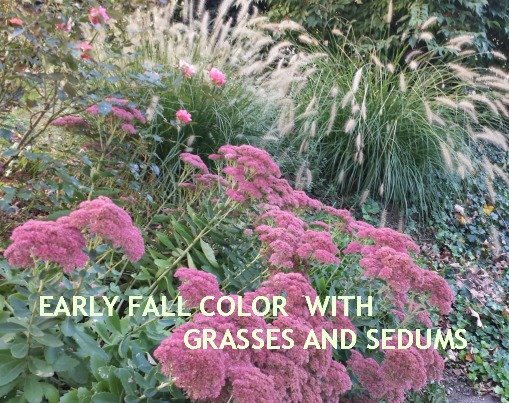 For example, you might use a group of five to seven tall shrubs and then a group of lower Fountain Grass. In front of the Fountain Grass place masses of Juniper, one of the low growing types. Throughout this planting, place three Lilacs for height, and possibly a tree. You can also include lawn. 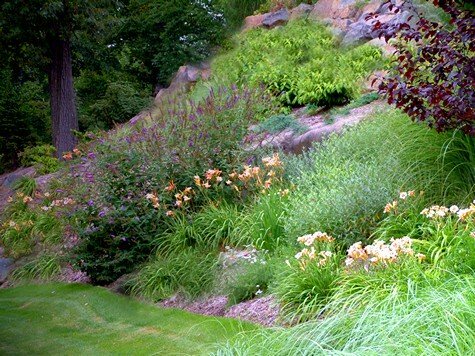 Many times people think of plantings only when landscaping steep slopes. 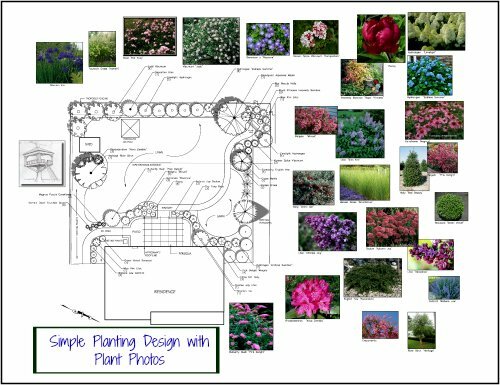 However, another way to approach the design, is to plan on the area being mostly lawn with planting beds as part of the picture. For example, there might be a curvilinear planting bed which goes along the top of the slope, continues down the side, and then appears along the bottom. Imagine the letter "C". The advantage of this, or something similar, is that lawn is relatively easy to care for. However, the plants create the interest. 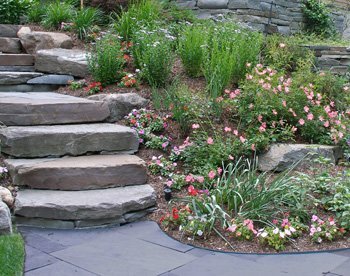 Landscape steps and walkways can be created through the lawn or planted areas. They can also be designed to go around the sides of the slope, rather than through it. If the path is going through the lawn, you can use stepping stones or a paving material, such as brick or pavers. You can also use nothing and walk on the lawn itself. This keeps the unity of the lawn and the open space, without breaking it up visually. If the path is designed to go through planted areas, you can again use stepping stones or a paving material. You can also just have a mulched path. Loose stone is another option. A mulched or stone path (especially the loose stone) should be edged. You can use something as simple as steel edging or something more decorative as pavers on edge. Paths can be anywhere from two to four feet wide. Two feet wide paths are quite casual, while wider ones become a bit more important. One may terrace a slope to create a flat, usable area. A retaining wall may be created at the top, bottom or both. Lawn may then be used for sitting, play areas or extensive gardens. The usable area should range in grade from two to five percent. Landscaping steep slopes may seem daunting at first, but a very nice landscape can be created. Just remember to use drought tolerant plants. Cover the planting beds with a three inch deep layer of mulch. Consider installing a sprinkler system. Plan on dense plant coverage by including masses of groundcover to deter weeds. Include a large area of lawn for low maintenance. 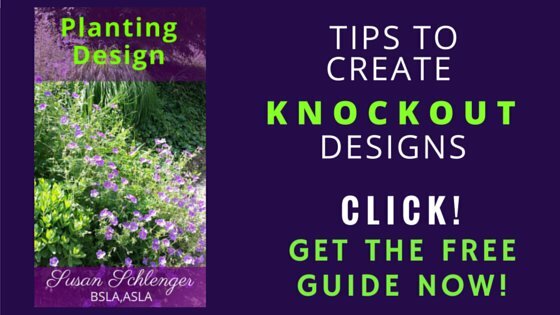 For additional landscape design help, please take a look at this helpful ebook on front yards. Just click on the book to read about what is in it. 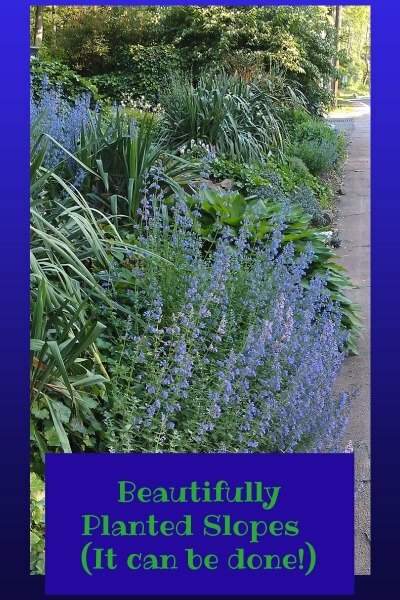 If you would like to include some great evergreen shrubs, this book has detailed information. Click on the book to find out more.